Hidden treasures are still discovered, even today. 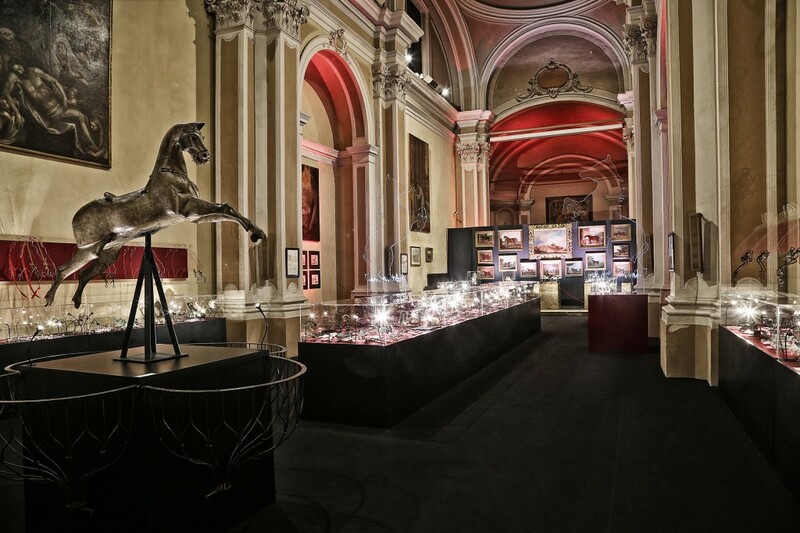 For those who love the history of horsemanship, to visit the exhibition of the Giannelli collection in Travagliato, Italy, is like entering into Ali Baba’s cave! I confess I was really surprised at what I found there. I did not expect such a rich exposition and such an impressive setting in a small provincial town. But I was wrong. 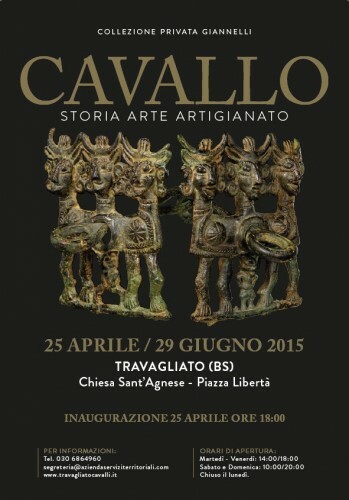 For the quality and completeness of the collection presented, the exhibition on display in Travagliato (not far from a Milan) until June 29, entitled Cavallo: storia, arte e artigianato (Horse: history, art and craft), could be held in great museums all over the world because it presents pieces that not even the British Museum, the Louvre, or the Metropolitan possess. I swear I’m not exaggerating. I have been studying the history of the equestrian culture for many years and I have often dedicated my research to the different types of bits in use during various periods. On this same blog, I began publishing a series of articles dedicated to this topic: Bronze Age bits; The Corinthian bit; Bitless equitation in ancient times; The bit that tamed the flying horse: Pegasus and Bellerophon. However, I had to stop because it was nearly impossible to find images and reliable information about the bits used during the Roman and medieval periods. The few scientific articles and books on this subject and the catalogs of the largest museums in the world, offered me little material to work with. So you can easily imagine my surprise when I discovered in Travagliato, hundreds of Mesopotamian, ancient Greek, Roman, Lombard and medieval findings, displayed side by side with the gigantic Renaissance and Baroque bits, along with some elegant nineteenth century specimens. But it is best now to proceed with some order in this article. First of all, you will probably want to know where this amazing collection comes from. Claudio Giannelli put it together through decades of passionate research. He is a truly unique personality, combining an extraordinary intellectual refinement with a politeness and class that seems to be from another time. The son of a cavalry officer, Giannelli grew up among horses and began riding at a very young age, taking good results in three day eventing and dressage. He graduated and practiced for several years as a notary. At some point, however, he decided to turn his passion for beauty and old things into a profession, becoming an important antiquarian. Meanwhile, he moved to Switzerland, where he still lives, and continued to ride, becoming also a three day eventing and dressage judge. His collection was born by accident. In the fifties, while browsing through the stalls of the flea market of Portaportese in Rome, he found an old bit, buried among various odds and ends. Gianelli, who at the time already knew the famous illustrations of Grisone and Fiaschi’s treatises, realized immediately that it was an antique piece, probably from the Renaissance. After the usual grueling negotiations, he bought it, managing to get it for a good price. 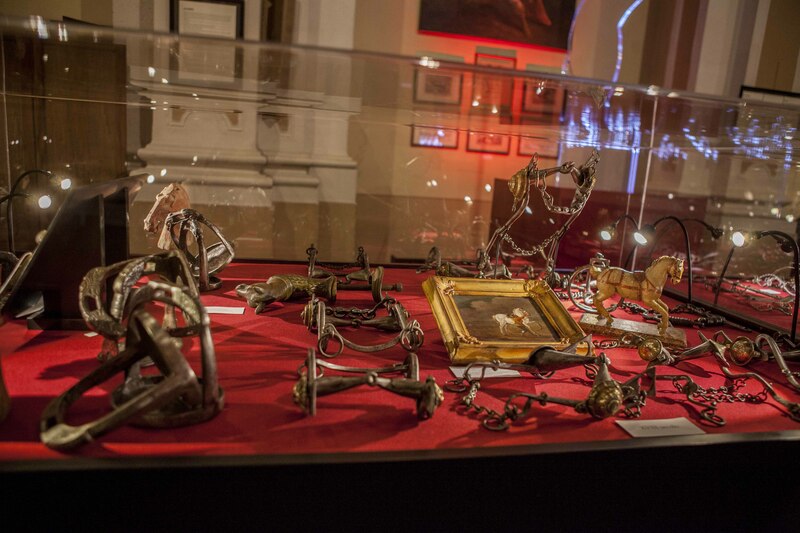 The rest of the collection came together through his love for horses and history, his unique culture and his expertise as an antiquarian. Within a few years, he was found in the most important auction houses around Europe, bidding for the finest ancient bits available on the market to the curators of museums like the Louvre, or the British, and to a very restricted elite of collectors from all around the world. The exhibition begins with some very ancient artifacts. 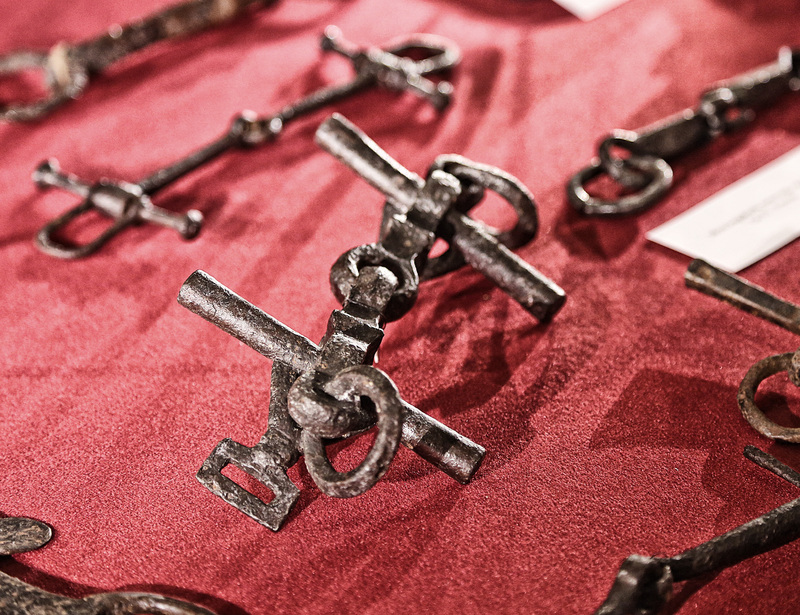 Some cheekpieces made of bone from Central Asia, dating back to the second millennium before Christ, are on display in the first case. It then goes to the Mesopotamian civilization, and then to ancient Greece. In addition to some very well preserved bronze bits, there are some very interesting psalion on display. 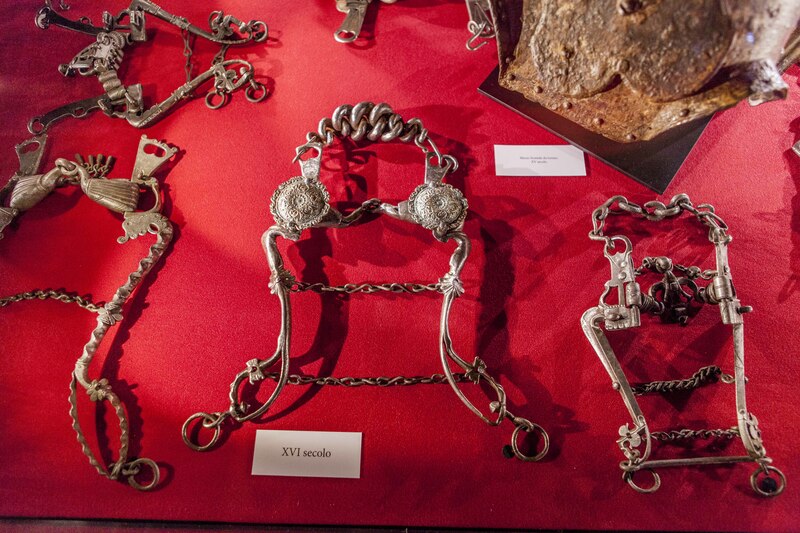 These were a sort of metallic noseband that restricted the opening of the mouth of the horse. There are also some perfectly preserved bronze muzzles. A beautiful shaffron (horse’s head defense) made of bronze, with its psalion, stands between the other findings. 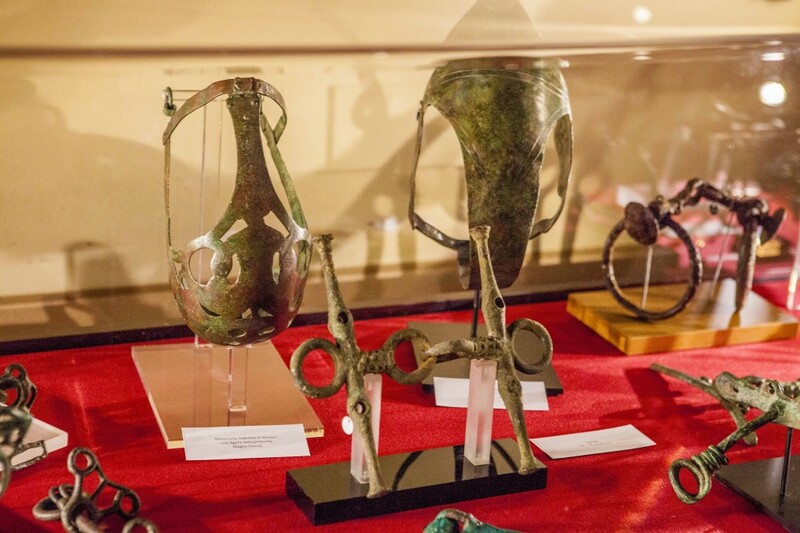 We then move to the Etruscan civilization, with several specimens belonging to the so-called Villanovan period [see the article on Bronze Age bits], characterized by beautiful zoomorphic cheekpieces. But the main attraction, with regard to the Bronze Age is the incredible collection of Luristan bits, dating from between 1100 and 700 BC. They belong to a mysterious civilization, which flourished between the second and first millennium BC, in a region of southwestern Iran. The remains were found mainly within the tombs, where they were placed under the head of the buried body. They are made of bronze and they consist of a cannon of a single piece, straight or slightly curved, with, at each end a cheek piece, the form of a winged animal. These figures of animals had a large hole in the body through which passed the end of the mouthpiece, and two loops to tie the bridle and the reins. Those which are displayed in Travagliato are absolutely extraordinary. 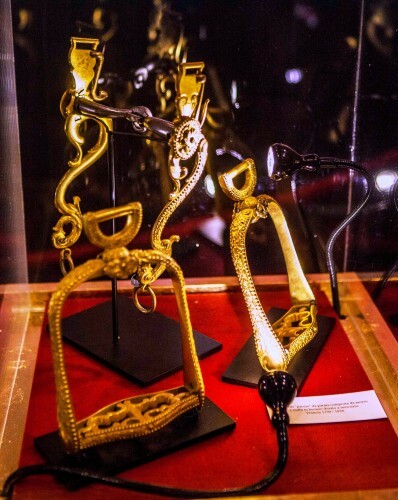 They also include a rare jointed snaffle, with cheekpieces decorated with anthropomorphic figures. This is the piece chosen for the exhibition poster. Neither the catalog of the British Museum, nor the Metropolitan, which also have important collections of these findings, can boast examples of this quality and condition. The incredible collection of bronze bits from Luristan, dating between 1100 and 700 BC. Also, the many Roman and medieval bits are very interesting. In front of their display case the heart of the scholar makes a jump. With the transition from bronze to iron, which is much more perishable, the findings from this era are, in fact, far more rare. Even in the books of the specialists, there are very few images to be consulted and they are almost always the same. The Giannelli collection shows snaffles similar to the current ones and the ancestors of modern curb bits. In fact, in Roman time, we start to find bits with long shanks, but still without a curb chain. The same specialists of this matter continue to argue about their exact principle of operation. They generally have a very rough and brutal look. The mouthpieces are often bristling with spikes and it is quite horrible to think of them in the mouth of a poor animal. Even the Renaissance bits look very severe. You can find in Travagliato exactly the same types of bits that are obsessively represented in the illustrations of the equestrian treatises of the sixteenth century. It is difficult for us to figure out that their incredible variety was conceived to fit the mouthpiece to the anatomical peculiarities of the mouth of each animal! Beyond this, however, you can not help but admire their extraordinary craftsmanship. Many of them are true masterpieces of metalwork and are all the more remarkable when you consider the simple technical means used by the craftsmen who made them. With the passing of the centuries, we note the progressive reduction of the length of the shanks. which decreases the lever action on the jaw of the horse, and the constant simplification of the mouthpieces. The progress of the training techniques demonstrated not only that strong bits were unnecessary, but that they were counterproductive. Despite being used by expert hands, it is easy to imagine that they exasperated the animals, subjecting them to unnecessary coercion. If, however, in the eighteenth century, the mouthpieces were gradually simplified and reduced in size, at the same time their workmanship became even more precious, in some cases like that of real jewels. The collection is completed, also, by some oriental bits: Chinese, Tibetan, Japanese and by a remarkable collection of wooden stirrups by the Mapuche Indians of Chile. This brief synthesis certainly cannot really express the beauty and the importance of the pieces that are on display, whose history and meaning are explained in a series of panels which make the course of the exhibition understandable also to non-experts. And the setting is enriched by several paintings of equestrian topics of major authors of the eighteenth and nineteenth century and many by original engravings, such as those from the books by Jan Van der Straet, Antoine de Pluvinel, the Duke of Newcastle, or from the beautiful plates about horseback riding from d’Alembert and Diderot’s Enciclopédie. 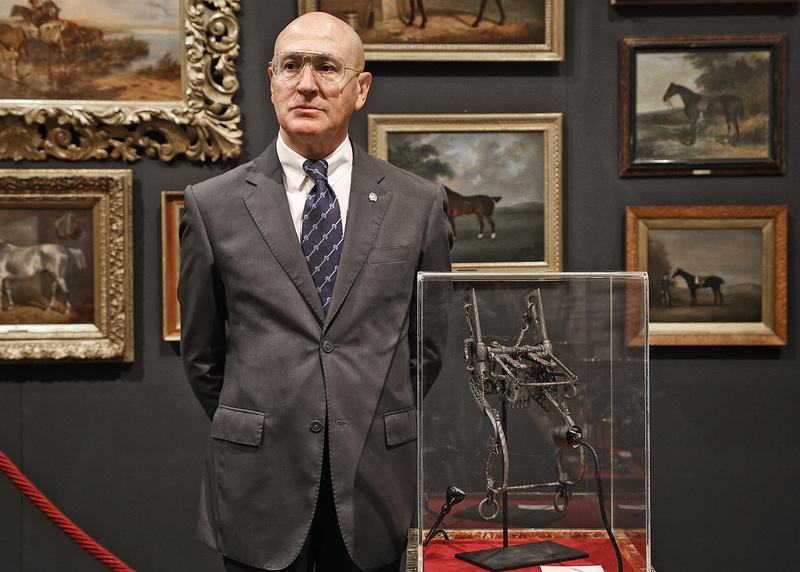 The exhibition of the Giannelli Collection, in Travagliato, offers an extraordinary journey through the history of thousands of years of coexistence between man and horse. A past that is too often idealized, or criticized, without an exact knowledge of the techniques and methods that were actually used in other eras. Instead, an extraordinary exhibition like this puts us in front of the concrete objects, stimulates our curiosity and denies stereotypes and legends. Studying the history of the relationship between man and horse does not mean to put a nonexistent golden age of horseback riding on a pedestal, but rather to illuminate an important chapter of our civilization. And it is useful for today’s riders to understand the roots of their passion and to learn from the mistakes and the wisdom of those who, over the millennia, have preceded them in the worship of these wonderful animals that are the horses. weekdays on request by calling +39 030 6864960. Claudio Giannelli is working on a book about his collection, which will be published next Autumn. We will keep you posted as soon as it will be published. Please notify me regarding your book when it is published. 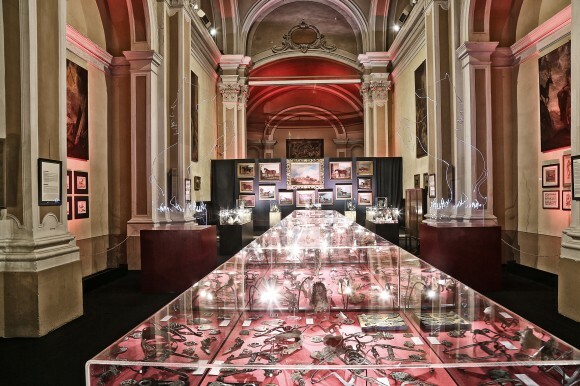 Awesome article on the Giannelli collection! Looking forward to the book. Please keep me posted. 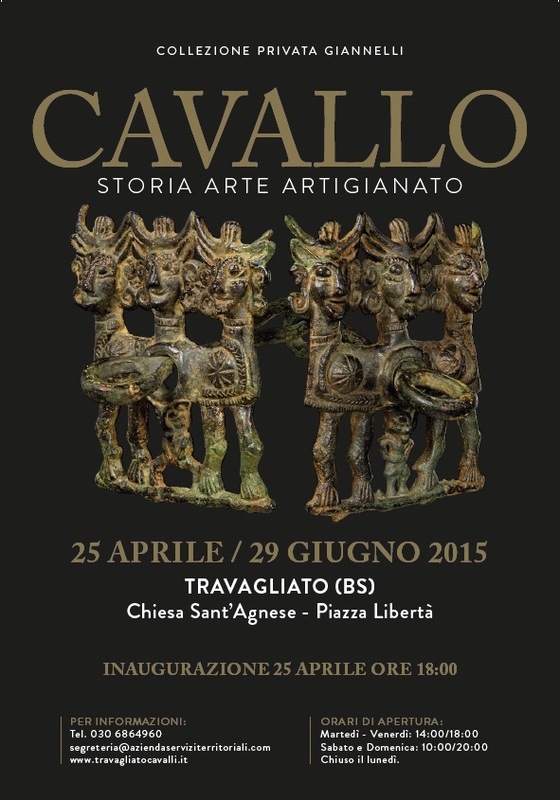 Also read your new book The Italian Tradition of Equestrian Art. Enjoyed it very much. Your passion is very obvious! Thank you! Thank you Jim! I’m very glad you like it. I hope you will keep following my blog and that we will keep in touch.